An otherwise healthy 37‐year‐old woman presented to a local hospital with left arm paresthesias and word‐finding difficulties. A head CT found a 3‐cm corona radiata lesion with mass effect and steroids were prescribed with improvement of symptoms. While awaiting further outpatient workup, she was found to be dyspneic, with recurrence of her left arm paresthesias and new migrating hyperesthesias. She was sent to our ED for further evaluation. A chest CT confirmed a pulmonary embolus (PE), whereas a noncontrast head CT showed a slight interval increase in size of the lesion. Further history from the patient revealed that her previous word‐finding difficulty had completely resolved, whereas her left arm paresthesias had resolved and then recurred. Consultation with neurology revealed suspicion that the lesion was more likely to be related to multiple sclerosis and less likely to be a neoplasm; thus, anticoagulation was started for treatment for her acute PE. A subsequent MRI showed multiple areas of high T2 and FLAIR signal, including the left periventricular area initially seen on CT. This was thought to be most consistent with a demyelinating process. The patient was discharged in good condition on both anticoagulation therapy for her PE and prednisone for her multiple sclerosis. Figure 1. Noncontrast head ct on initial presentation. Multiple sclerosis has a national prevalence of 1 in 1000, with increased risk among women and those of northern European descent. Classically, patients have neurological symptoms such as paresthesias, optic neuritis, or weakness that remit and then recur. Radiographically, patients usually develop periventricular white‐matter lesions that are easily seen on MRI. Diagnosis is based on a combination of clinical history and radiographic findings, as there is no single test diagnostic of multiple sclerosis. As in the present case, multiple sclerosis occasionally presents radiographically with CT imaging consistent with neoplasm. This is known as tumefactive multiple sclerosis. 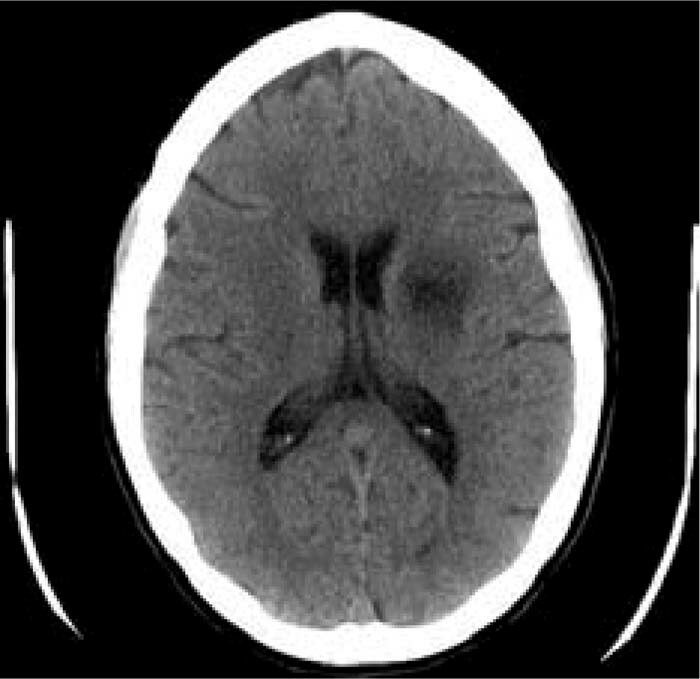 In addition to the obvious long‐term management differences, it was important to make the correct diagnosis rapidly for this patient given the concerns of using anticoagulation (to treat her acute PE) in the presence of a brain tumor. This case demonstrates an unusual presentation of a common disease process. Given the patient's age, history, and clinical presentation, the diagnosis of multiple sclerosis far outweighed the likelihood of a CNS neoplasm. An early and accurate diagnosis in this case had obvious management implications. MRI eventually proved that this was a case of tumefactive multiple sclerosis. P. Gupta, University of Michigan, employment; R. D. Santos, University of Michigan, employment. Gupta P, Santos R. Not All Brain Lesions Are Created Equal. Abstract published at Hospital Medicine 2008, April 3-5, San Diego, Calif. Abstract 147. Journal of Hospital Medicine. 2008; 3 (suppl 1). https://www.shmabstracts.com/abstract/not-all-brain-lesions-are-created-equal/. Accessed April 21, 2019.